With the American government in shambles and Jefferson Pierce (a.k.a. Black Lightining) now President of the United States in the wake of Aqualad's terrorist attack on Ra's Al Ghul, a newly formed Congress is out for answers Someone must pay for the crime and their first target is Batman, whom they know was working in secret with the President and may have wished a more agreeable partner in building a better world. What follows may be the greatest trial Bruce Wayne has ever faced in every sense of the word. 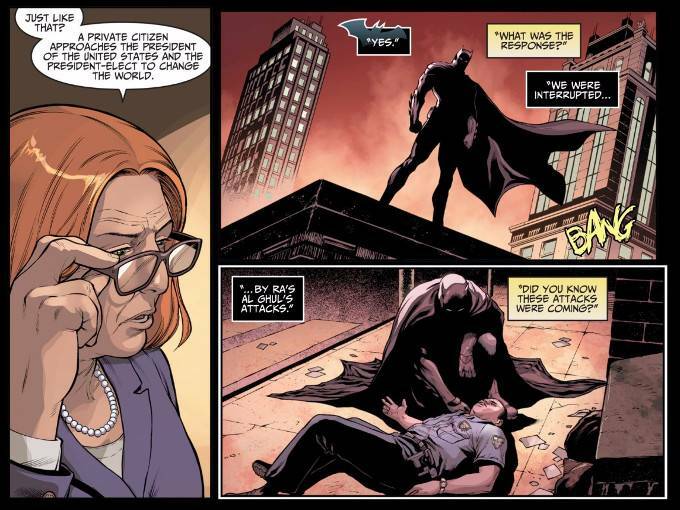 Reading Injustice 2 #28, I'm unsure which aspect of the comic is greater - the story by Tom Taylor which raises an interesting point about how Batman's actions may be sending him down the same slippery slope of idealism as Superman (a point that never rang true in the original games) or the artwork by Daniel Sampere, Juan Albarran and Rex Lokus, which looks fantastic and is full of wonderful little moments such as a tribute to the opening of the original Batman: The Animated Series cartoon. In the end, it doesn't matter. This is a great comic any way you slice it and a good jumping-on point if, for some reason, you don't wish to start this series from the beginning.